As part of The Quarters Downtown redevelopment, the City of Edmonton is working on a new park for the area called Kinistinâw Park. This new park is intended to create a community space for people to gather and to attract further redevelopment to the area. Phase I construction of this park is anticipated to begin in Spring 2019. Kinistinaw Park is currently an under-utilized open space located in the community of Boyle Street. 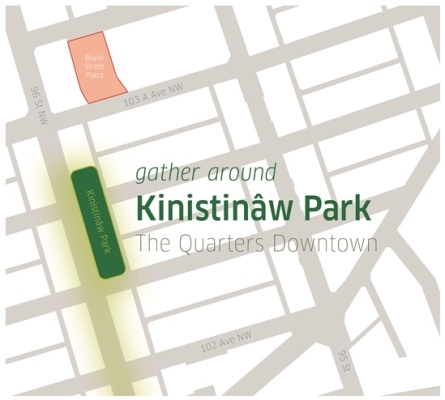 As the centrepiece of The Quarters Downtown, Kinistinaw Park is envisioned as an inviting and safe urban park. The design of Kinistinaw Park will reflect the past, present, and future stories of the community, encouraging everyday enjoyment and special opportunities for celebration and gathering. Integrated with the surrounding streets and properties, the park will be a dynamic and well-loved neighbourhood destination that is a source of local pride. Kinistinaw Park will be built in 2 phases. The first phase is the block on the east side of the Armature (96 Street), between 102A Avenue to the north side of 103 Avenue. Still in Concept Design, Phase II plans to feature an open plaza with a covered tree canopy, water feature and stone slab for sunning gathering. This work is dependent on funding.